Reference services: the dinosaur in the commons? 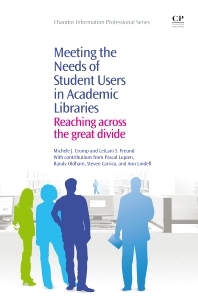 Meeting the Needs of Student Users in Academic Libraries surveys and evaluates the current practice of learning commons and research services within the academic library community in order to determine if these learning spaces are functioning as intended. To evaluate their findings, the authors examine the measurement tools that libraries have used to evaluate usage and satisfaction, including contemporary anthropological studies that provide a more detailed view of the student’s approach to research. The book takes a candid look at these redesigns and asks if improvements have lived up to expectations of increased service and user satisfaction. Are librarians using these findings to inform the evolution and implementation of new service models, or have they simply put a new shade of lipstick on the pig? Explores behind the statistics as to why users come to the library; does the librarians’ concept of ‘the library as place’ match user perception? Michele J. Crump is the head of Access Support for the George A. Smathers Libraries at the University of Florida, USA. Her research focuses on user-centered services such as unmediated interlibrary loans, patron driven acquisitions, and emerging technologies in the library. Michele has served in various technical services positions, including Emerging Technologies Librarian, interim Director of Technical Services Division, and chair of the Acquisitions and Licensing Department. LeiLani S. Freund is the Assessment/Information Services Coordinator and the Linguistics selector and subject specialist at the Library West Humanities and Social Sciences Branch of the University of Florida George A. Smathers Libraries. LeiLani has served in a number of managerial positions, including a recent term as the Interim Chair of Library West following two years as Associate Chair.